Many people feel it is important to know a little about the company that they shop with. There is something comforting about knowing the history of Alive Health Centre and its solid foundation. It is also encouraging to know about what Alive hopes to hold in the future. For those who are interested I have taken the time to provide you with a brief history as well as the future of Alive! First of the all the name Alive came about from the owner Alice Chung. 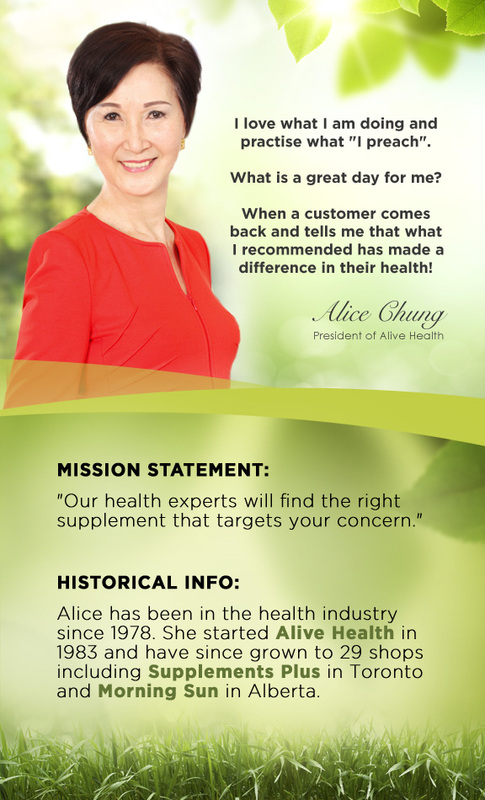 Over 25 years ago Alice and her husband were trying to come up with a name that would be fitting for her health store. She wanted her passion for natural health to resonate through the name. It came fairly easy and then everything else from there fell into place. Alice started out with her first store in 1983 at Richmond Centre Mall in British Columbia. She now has 29 locations in Canada. She has Morning Sun stores in Alberta and Supplements Plus stores are in Ontario and BC. People that have met Alice always notice that she is filled with energy and a positive attitude. Alice admits that when she was young she had a weak immune system and often had low energy, but after taking care of herself first and foremost, she has been able to take care of her family and then pass on her extensive experience and knowledge to her loyal customers. Now she is often described as a young 62 year old that is always smiling and always excited to help a customer with their health concerns. She works six days a week and is always in the Oakridge location Thursdays, Fridays and Saturdays from 11 to 5pm. So by now you may be wondering who is the face and voice behind these words. The answer is Shannon Chung, Alice’s daughter-in-law. Alice refers to me as the future of Alive. Although, do not worry she wants to work with me until she is 80! While I have learned about Alive and its past, Alice says that she is very excited for the future of Alive. I have big shoes to fill, but she is confident that I will be able to help her customers just as well. I also work in the Oakridge location but on Sundays, Mondays, Thursdays and Fridays. Please feel free to come and visit us, we would be glad to genuinely help you with your health! If Oakridge is too far, visit our contacts page to find a location near you. Alive Health Centre is in British Columbia, Morning Sun is in Alberta, and Supplements Plus is on Ontario with one location in BC. You can visit the Online Alive Health Centre Website as well!